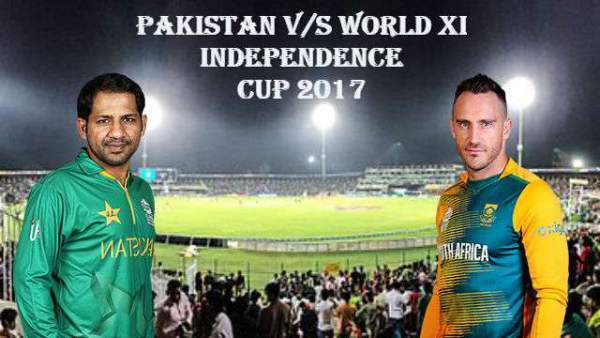 Pakistan vs World XI: The live streaming and live cricket score of 3rd T20 will be available on PTV Sports, DSports, Hotstar, crictime, smartric, cricketgateway, and other online stream portals. Here’s how to watch live cricket match online along with today match predictions. The three T20 game Independence Cup series has reached to an interesting point. Both the teams have won one match each. Whichever side wins the third and final game will win the series. Pakistan’s efforts have resulted them gaining this cricket tournament on home ground. In the last eight years, no international cricket team visited them for any format of the game. It happened because when Sri Lanka last time visited in 2009, their players suffered a terrorist attack. World XI’s Thisara Perera (Sri Lanka) hit a six at the end of second twenty20 and his effort made the team fetch victory against Pakistan. They won by seven wickets. Pakistani team won the first of this three match series. Perera made 47 not out out of 19 balls with five sixes and Hashim Amla scored 72 off 55 balls. Their efforts made the team to target down 175 runs. It resulted into tie so far. The last game will tell the result and will also be played in Lahore. In the first game, Pakistan won by 20 runs which marked the return of international cricket to the hosts. Today’s match will start at 7:30 pm IST (7 pm local time) at Gaddafi Stadium in Lahore. It’s their giant step towards reviving international cricket. If all goes well with the current series, the Pakistan Cricket Board will host a three-match T20 home series against West Indies and one T20 against Sri Lanka. Moreover, it has been reported that PCB chief Najam Sethi has requested Cricket South Africa for a bilateral home series in Pakistan. Both the teams look confident and have potential. So, it’s difficult to predict which team will win.